I just picked up an interesting book yesterday from the bookstore called “Lord Save Us From Your Followers”. It came out alongside a move by the same title in March of this year. I’m not sure why I hadn’t come across it before – I usually pick up on things like that through the blogosphere, but somehow missed it. I’ve been tearing through the book – I’m already half done and will probably finish it tonight. It’s an easy read and I really like the style – very conversational and informal. 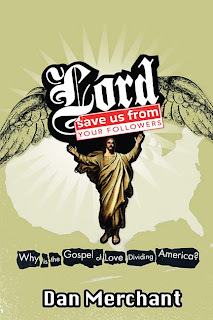 In the book, Dan Merchant, the author sets out to ask the question “Why is the Gospel of Love dividing America?” Through interviews with people from all sides of the situation, he asks some really great questions and brings up some really great points. He goes on to talk about several examples of notable Christians on television (Pat Robertson, Jerry Falwell and James Dobson, to name a few) who have, from time to time, said things that make the rest of us Christians, well, shudder. I’m really looking forward to finishing the book and I’m going to find the movie and check it out some time. I’d encourage you to check out their website too. You can catch a trailer for the movie, which sums up the book too.